If your gums are tender, puffy, or bleed when you brush or floss, you may be among the 20 per cent of Australian adults with gum disease. And gum disease is the most common cause of tooth loss in Australia! Gum disease, begins as a reversible condition called gingivitis. Caused by bacteria, untreated gum disease causes the gum to separate from the teeth, forming a bacteria-filled pocket. Having bacteria beneath your gums is like having rot in your walls. No matter how much you work you do on the surface of them, they will eventually weaken and collapse unless the root cause of damage is treated. 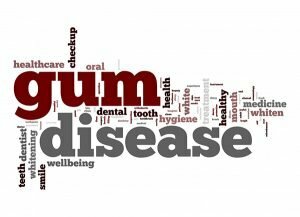 This is why Bondi Dental wants you to know the causes, protective tactics against, and cures related to gum disease. Gum disease is an inflammation of the gums caused by the bacteria in plaque; a sticky, colorless film that is constantly forming on your teeth. If plaque is not removed by daily brushing and flossing, it builds up and the bacteria eventually infects the gum tissue and bone that support the teeth. This can cause teeth to become loose, fall out, or require removal by a dentist. The risk factors for gum disease suggest some of the things you can do to avoid gum disease, or aid recovery from it. Stress—Stress weakens your body’s immune system. This makes it harder for your body to fight off infection, including periodontal disease. So, do everything you can to stay healthy, and work with your dentist and doctor if you do share any of these risk factors. Gum disease can be prevented with good oral hygiene. Here are a few ways you can prevent gum disease on your own at home, before you even have to worry! Floss daily, brush twice a day. Use fluoride toothpaste, which will keep your gums looking fresh and reduce plaque. Get regular checkups and cleanings! What Can Bondi Dental Do To Treat Your Gum Disease? For gingivitis, we remove plaque and tartar both above and below the gum line. We irrigate any infected areas with a rinse to flush out and kill more bacteria. If the gingivitis seems serious, we sometimes ask to see patients about a month after initial treatment, to ensure the gum disease was effectively treated. Mild periodontitis is usually treated with a cleaning called scaling and root planing. Scaling removes plaque and tartar from your teeth. Root planing digs beneath the gumline to clean smooth the root surface. This makes it harder for bacteria to adhere there and easier for the gum to attach. In some cases, we may also prescribe an antibiotic. Once the disease has advanced to this stage, you will need to return to the dentist for more frequent cleanings. For moderate periodontitis, in addition to the scaling and root planing therapy, we may place an antibiotic directly into the pocket to eliminate any bacteria that the cleaning alone can’t reach. Other options include laser therapy to remove the unhealthy part of the gum. Severe periodontitis can require surgery. Typically, the pockets between teeth and gums are deeper than six millimeters and there is permanent bone damage. Some teeth may be so loose, they can’t be saved. Your teeth may have to be extracted replaced with a denture, bridge or dental implant. Obviously, you want to avoid this with a solid oral hygienes regimen at home, and regular visits to your Bondi Dental dentist! Bondi Dental is located in the Sydney area, at Bondi Beach. We offer high quality dental preventative, restorative, and cosmetic services for all patients, including children.